I reckon I discovered Charles Mingus when I was about 16, just a few years after he died. The first album of his I bought was the 1970 “Pithycanthropus Erectus”; not a classic but I loved it. I then found an album called “The Wild Bass”, which turned out to be “Mingus Three”. 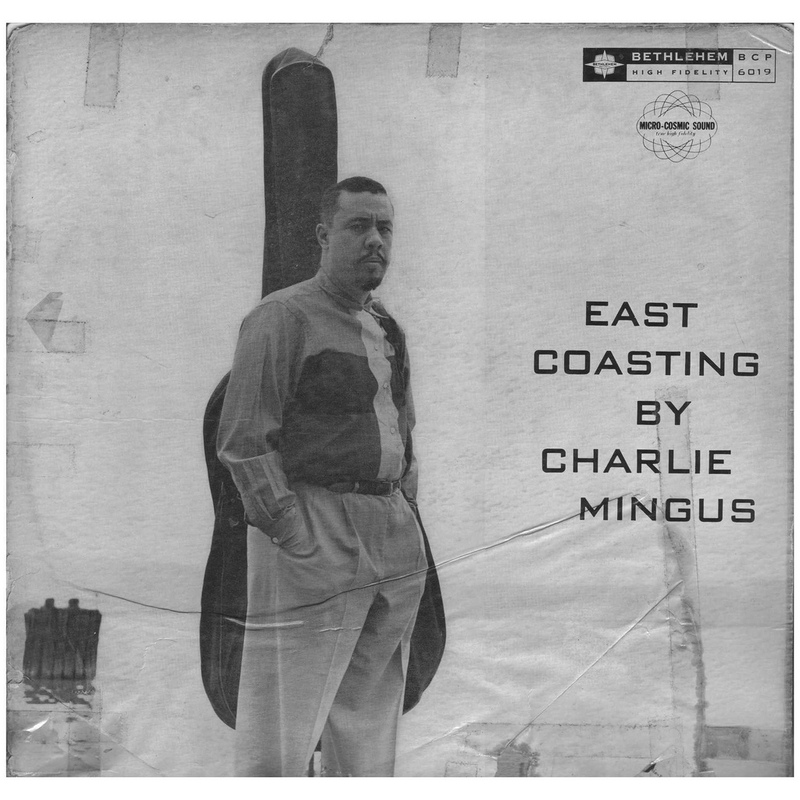 The third Mingus album I got was “East Coasting”, which my brother bought me. 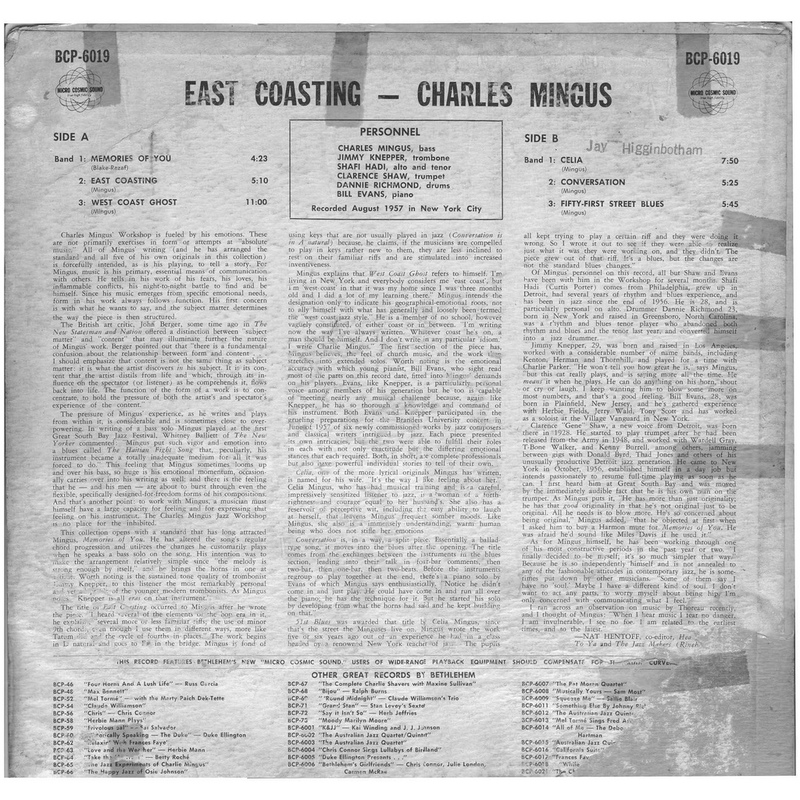 It’s interesting to listen to pre-1957 Mingus. It’s clear he’s trying to find his own voice; there’s some great stuff, together with attempts at styles which others did far better. Nineteen fifty-seven, however, really was a watershed. I don’t know what happened or why, but all the work- the thousands of gigs and countless hours of practice- flowered, and remained in bloom until his hiatus of 1965 – 1969. Nineteen fifty-nine is the famous jazz year, but 1957 was Mingus’s year in which he produced several great albums (several! in one year! ): “The Clown”, “Tijuana Moods”, “A Modern Jazz Symposium of Music and Poetry”,…..
….and “East Coasting”. What a gem! Dannie Richmond, whom Mingus met shortly before, is on drums, and the front line is typical Mingus: the great Jimmy Knepper on trombone (Mingus loved low horns) and two relative unknowns: Shafi Hadi on saxophone and Clarence (“Woody”) Shaw on trumpet. Three interesting musicians: Jimmy was truly a trombone great, and Woody was perfect for Mingus’s 1957 work, but Shafi Hadi isn’t amongst the top sax players around at the time. However, with Mingus standing behind them, these musicians all play out of their skins, producing short, melodic and memorable solos which fit with their respective pieces, including the explosive trade-offs in “Conversation”. I suppose East Coasting is typical of its time: a big name leading a small group, three or four tracks per side; play a chorus, give everyone a solo, then out. Why is East Coasting a gem? For one thing, because of the quality of the playing and, for another, because mature Mingus music always goes somewhere and always means something. A few years ago, I decided I had to have an early pressing. They’re expensive on ebay and don’t come up often, but I managed to buy a very battered copy, unplayable really, with a cover falling to bits. I love it though, and take it out to look at a couple of times a year. I was tickled to find my copy has “Jay Higginbotham” stamped on the back: I was even more excited when I saw Jay Higginbotham standing next to Mingus in the iconic (and I think I use that word correctly) “A Great Day In Harlem” photograph from 12 August 1958! I’ll never know whether my copy once belonged to JC, but I like to believe it did. Fifty-eight years have passed since this album was recorded, and about thirty since I first heard it, and this gem just keeps getting shinier. You are currently browsing the Chris1729's Blog blog archives for August, 2015.